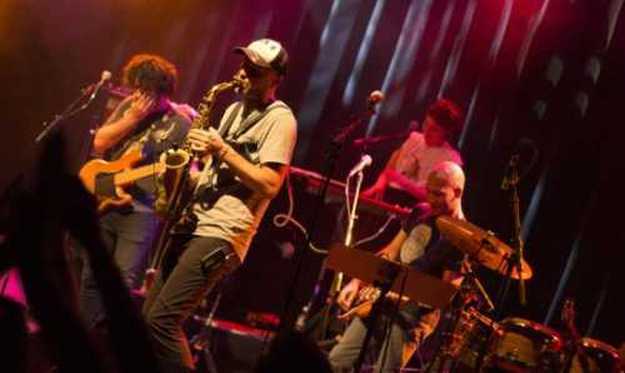 Balkan Beat Box took the stage Sunday at the Fox Theatre and played to a crowd that seemingly enjoyed all that the Israeli musicians had to offer. Their beats were infectious and had everyone moving about with an indescribable air of freedom. The group performed primarily Middle Eastern grooves mixed with hip hop song structures that allowed Tomer Yusef to unleash wave after wave of political insight. With Tamir Muskat leading the beat of the drums and Ori Kaplan on saxophone, it was clear that their live performances made their music much more grandiose, as each song flowed in with such groove. There was a vibe that anyone could jump to, making it nearly impossible not to join in on the dancing. It was a very energetic concert that left the crowd wanting more from every aspect of the performance. With their use of delays and samples to add more texture to their tracks, it’s easy to see why Balkan Beat Box had such a long and prosperous career thus far. They have a dedicated fan base that they please with each progression in their albums, and they were sure to add in their singles from their up-and-coming record Shout It Out that will be dropping mid-November.